Garage doors have come a long way since the 1920’s when both the garage door and the electric garage door opener was invented. Technology has change almost all aspects of our lives and will continue to integrate into our daily lives, which includes the operation of the garage door. Everything about a garage door is getting safer and the primary reason why is the emerging smart technology available. Read this list of technological advances that has made garage door systems safer, more secure and smarter than ever before. One of the newest advances in the garage door industry has been the use of apps to operate and monitor your garage door. Homeowners don't have to be near the door to operate it, they have total access of their garage door from their phone. When anyone is opening or closing your garage door the app will notify you immediately. You can give access to repairmen, delivery person, or friends without having to give them the access code to your keypad. The app will also provide you with details on when your garage door was opened and closed and the dates and times it was accessed. 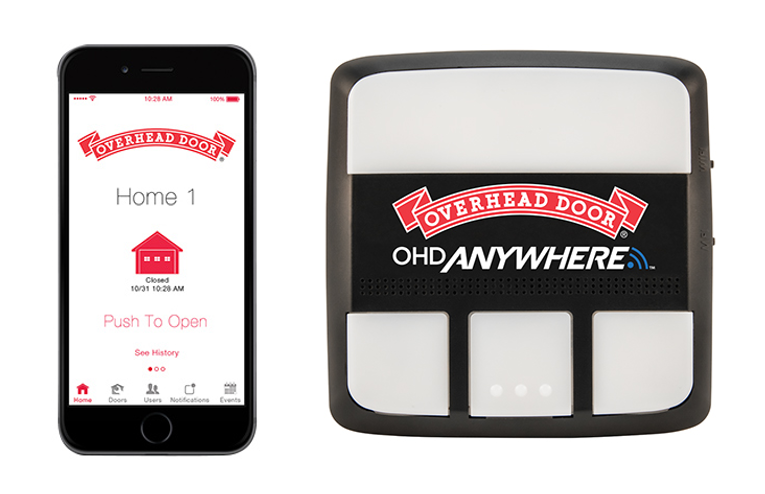 What makes this app different from all the other garage door apps out there is the OHDAnywhere uses a device that mounts on the garage door so even if the door is detached from the operator, it will still provide you with access information. In 1993, it became a requirement for garage doors to have photo-eyes installed. These photo-eyes will stop the door from closing if something crosses or is in the way of its infrared beams. Garage door safety sensors are usually located about 2 inches off the floor on both sides of the garage door. If the sensors are malfunctioning, one will start to blink. This means something is obstructing the beams and needs to be moved before the door can operate, the beams are not aligned properly, or the lenses of the beams need to be cleaned. This technology was put in place mainly for safety, so it’s important to make sure your safety sensors are always functioning properly. Most people don’t think about their opener when the power goes out. Many manufacturers include battery back-ups on garage door openers, so you’ll never have to worry about getting a car out when a storm cuts the power to your house. You can also buy a battery back-up separately, which plugs into your opener. Mostly all remotes for garage door openers include rolling codes, which means every time you press the button on your remote a new code is generated. This protects your remote from being hacked. In 2015, Security Researcher, Samy Kamkar converted a Mattel toy into a device that can grab the code of some garage door openers and remotes. Luckily, this hacking device can only work for older garage door openers that use dip switches and newer model openers use rolling code technology which stops this type of hacking from happening. If you have an older model garage door opener and want one with the new rolling code technology, then contact us today. All Overhead Door® Wall Consoles (newer ones) have something called SureLock™ which allows homeowners to lock the operation of the garage door opener. This is a great feature for those wishing to lock the operation of the door when away on vacation. Long gone are the days of your basic garage door controls. There’s two specific controls we’d like to feature here, the Overhead Door® Advanced Wall Console and the Overhead Door™ Door Report™ remote. The Advanced Wall Console provides lighting and opener performance status while also giving you the ability to receive service reminders with the contact information of your local Overhead Door™ Distributor. SureLock™ is a built-in feature which allows you to lock your door from operating while away or at night. The cool thing about this wall console is that it features an LCD touch screen, which will make it look like you have a garage door system from the future. The Door Report™ is another great technology for garage door remotes. With standard garage door remotes, you close the door and you won’t know whether you closed the door or not when you drive away. Many times, we forget the routine things like locking the door, unplugging a straightener, and closing the garage door. When we do the same things every day we don’t think about them while doing them, which can cause us to easily forget if we did them or not. With the Door Report™ you’ll never have to ask if you closed the garage door. How it works is it makes a beeping sound while flashing a green light to let you know your garage door has fully closed. If your garage door didn’t close, then the remote with give you a warning tone and flash a red light. These technologies have helped make garage doors smarter, safer and more secure. Leave us a comment and let us know how technology in the home has changed the way you live on a daily basis.